Mmmmm Yogurt, originally uploaded by Craftydiddl. Well it’s Sunday and since i don’t have much to show i thought i would post a funny picture. 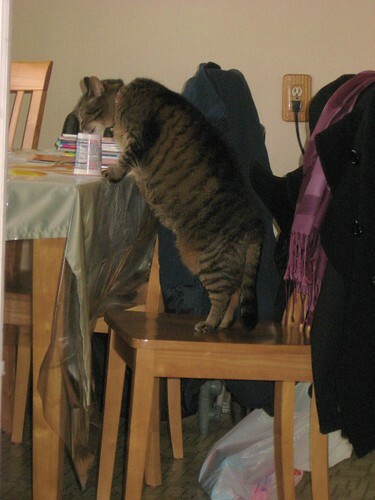 Here is my girl kitty, Cleo having some yogurt. Yogurt is her favorite people food and she knows when you are having some even if she doesn’t see you get it out. She will be right be me in less than a minute after i get it and sit by my feet and wait until i am done. Why? because i love her and she knows i will put the cup on the floor and let her lick out any tidbits that i have left and sometimes i will even leave her some extra tidbits. Well yesterday i had some yogurt and Cleo was no where to be seen. Right after we were leaving for a walk and i thought i had put the yogurt up in the garbage and i remember thinking “oh no i didnt put it on the floor for her to find” and as i was putting on my shoes in the living room i looked up into the kitchen and saw Cleo on the chair licking the cup-I had to get a picture even though she is technically being naughty (my kitties cant be on the table but they sneak up there all the time). I was bad to leaving her fave treat on the table and chair pulled out. That is a lot cuter than my standard poodle licking the butter when I leave the butter dish unattended on the counter.